Central to Bacardi Limited's 'Champions Drink Responsibly' campaign are 'Mocktails' – the enjoyable alcohol free alternatives to cocktails. We understood that in order to enable people to take time out from drinking and pace themselves, non-alchoholic drinks needed to be more accessible and distinctive. To do this we created MixLab, a mixology tool that gives you over 90 delicious 'Mocktail' recipes at the tip of your fingers. Developed as a creative platform for non-alcoholic mixology it came to life in a variety of ways, giving the Champions Drink Responsibly campaign a practical way to enable responsible drinking all over the world. 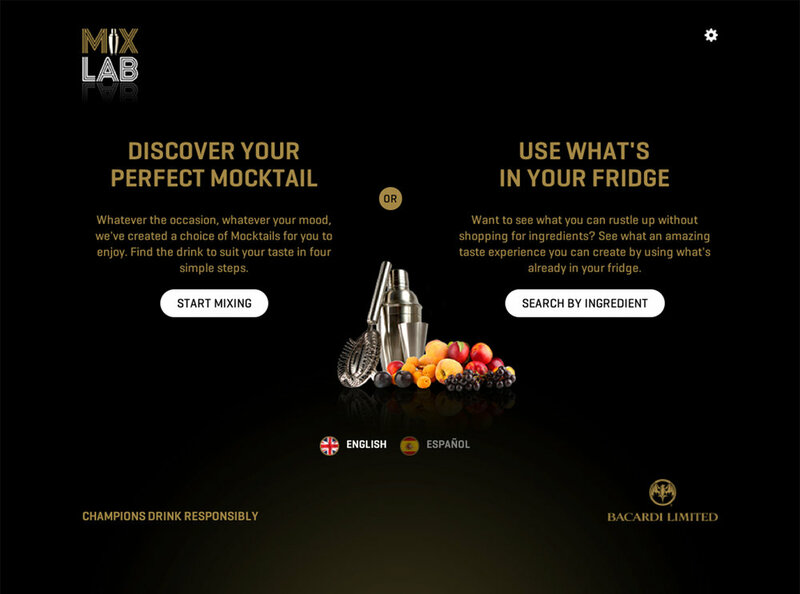 The MixLab web app was designed to act as a virtual barman, offering the same experience that you’d get if you walked into a bar. It guides the user through the ‘Mocktail’ selection process, giving helpful and relevant information along the way. People think making Mocktails requires specialist equipment that's expensive to purchase. However it's possible to make the majority of our Mocktails from items in your kitchen cupboard. So we showed people how to simplify complex techniques and gave them handy hints on mixology – whether it's getting the right shake or making the perfect garnish. Across Instagram, Facebook and YouTube we used MixLab as a platform to make Mocktails an aspirational alternative to alcohol that could be easily made in any environment and with accessible ingredients. by Bacardi Limited and was used extensively upon launch – from all over the world, with an average of 1250 Mocktails being discovered every month subsequently.